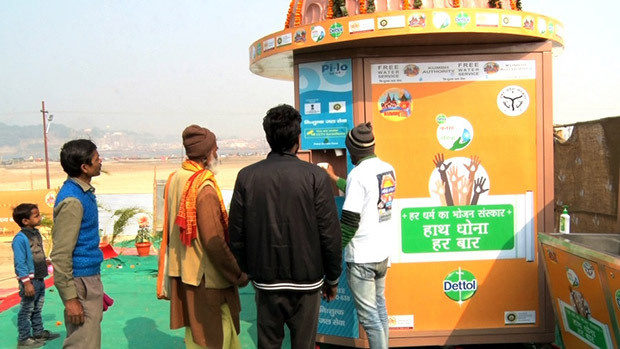 To bring about behaviour change towards ensuring cleanliness, consumer health and hygiene company Reckitt Benckiser has unveiled its awareness campaigns focusing on ‘hand hygiene’ and ‘sanitation’ at the Kumbh Mela. Dettol Harpic Banega Swachh India aims to raise much-needed awareness among the attendees about proper hygienic practices and incentivise them to observe environmental and river-friendly practices. Nearly 12 crore people are visiting the Kumbh this year, expected to be the world’s largest gathering of people.A report by the Harvard School of Public Health stated a 5% increase in diarrhoea-related diseases during the Kumbh Mela 2013. The campaigns aim to ensure that cleanliness and hygiene is on the top-of-mind responsibility of each pilgrim visiting the mela. ‘Haath Dhona Har Baar’ campaign by Dettol aims to highlight the occasions of handwashing with catchy taglines like ‘Har Dharam Ka Bhojan Sanskar, Haath Dhona Har Baar’, 'Bimariyon Se Bachne Ka Upchaar, Haath Dhona Har Baar’, 'Shauch ka sahi vyahvaar, Haath Dhona Har Baar’. Thecampaign aims to educate people around the importance of washing hands to remain germ-free. To create awareness around toilet hygiene, Harpic launched its ‘Hoga Toilet Vidhi Ka Gyaan, Toh Badhega Kumbhka Maan’ campaign that calls visitors to flush water every time they use a toilet as a sign of respect to the next person using it. With pilgrims coming to Kumbh from far and wide, Dettol and Harpic have come up with innovative ways to deliver their campaign messages by organising nukkad nataks within the mela as well as creating life-size wall paintings across 54 villages surrounding the venue. Making a perfect visual representation to showcase the importance of these campaigns, the impact will be significant. Dettol has deployed ‘hand mascots’ who will recite the story of the hands coming in contact with germs and educate people of hand wash need and practice. The mascot will share Dettol soaps to encourage personal hygiene.